My experience as a Newman’s Own Foundation Fellow at United Philanthropy Forum has been profound and full of lessons from dynamic leaders from across the world. 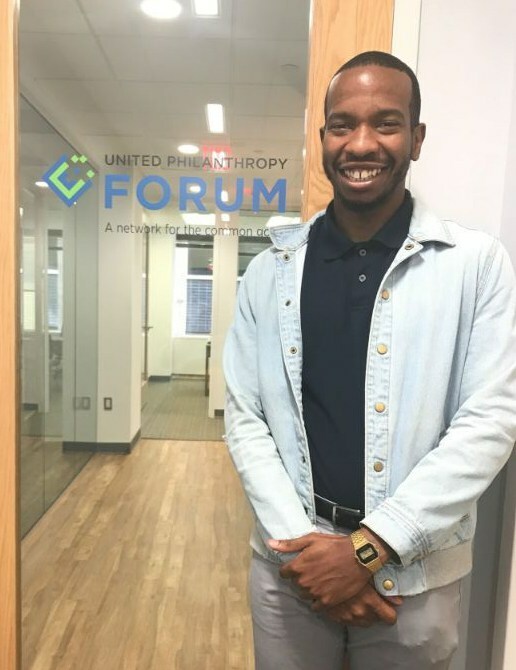 United Philanthropy Forum operates as a network serving philanthropy in America, consisting of regional and national philanthropic serving organizations (PSOs). We provide resources, data, offer webinar opportunities, facilitate collaboration, inform, and support the work of philanthropy. Initially when I started as a Fellow at United Philanthropy Forum I was nervous because I did not have much knowledge about the inner workings of PSOs. Fortunately, the team was very open about sharing information with me and threw me into the work immediately. My first project was compiling resources for the racial equity, diversity and inclusion scan. While this project was a lengthy endeavor I was able to learn about dynamic leaders who were speakers, trainers and facilitators for racial equity, diversity, and inclusion. This ultimately served as a reminder of the importance of providing organizations with the resources to extend their work for the common good to as many people in need as possible. While working on that project, I realized that the leadership roles, and the subjects I studied connected with the work that I was doing. This made work, for me, more fulfilling, and allowed me to connect with it on a different level than what I initially expected. While my first project was an epic one, I had to prepare myself for yet another legendary escapade. It just so happened to show up before our annual conference, which took place July 16-18 in Boston. It was a great learning experience working with the team to prepare boxes for mailing, schedules for the conference, the program handbook, and discussing the conference in our meeting room. It was at our conference in Boston where I was able to meet the same people I did research on for the racial equity, diversity, and inclusion scan. It was truly a humbling experience to learn about the aspirations, work, plans, and passion of my colleagues from all over the world. My time at United Philanthropy Forum has been a captivating experience showing me how interconnected the work of philanthropy is to the common good. Overall, I am extremely thankful for this opportunity from both Newman’s Own Foundation and United Philanthropy Forum. I am especially grateful for my team as well considering that I was extremely nervous about making a good first impression. This nervousness was alleviated when I had my first staff meeting and was given a welcome card. Our interactions as a team, and my experience at the conference reminded me of the fellowship orientation lesson about serious fun, one of the Foundation’s core values. The work that we do is indeed pivotal, but we still find ways to continue to keep the joy alive on a day to day basis. I am excited to see what else I learn and experience during my remaining time at the Forum!